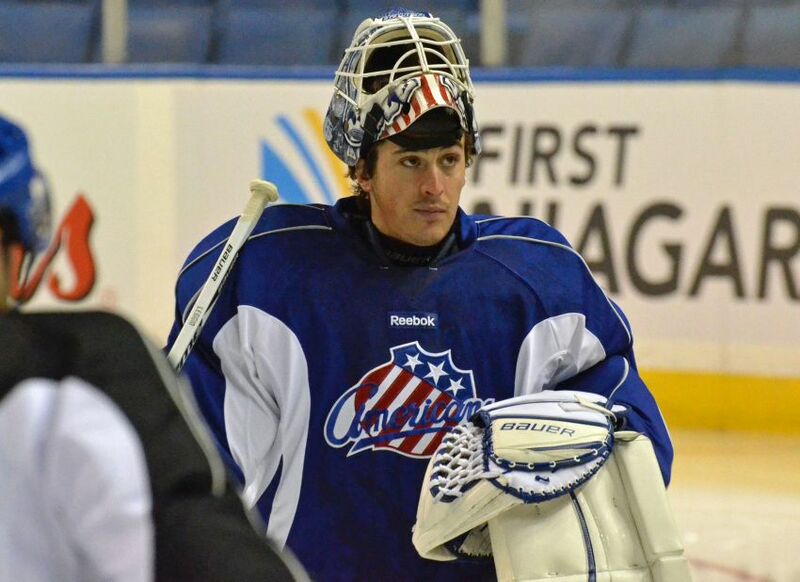 Williamsville native David Leggio can laugh and smile now reflecting on a crazy seven months. A season that began with the veteran goalie sitting at home looking for work ended with him celebrating a championship wearing lederhosen following a dynamic 14-game playoff run starring for Munich WHC, a team in the German DEL. In perhaps the finest of his eight pro seasons, Leggio, 31, went 14-8 with a 2.02 goals-against average and a .927 save percentage in 23 regular-season games. His playoffs numbers – 12-2, 1.76 and .930 – were even better. “I had to bounce back this year or it could’ve been a wrap for me,” he said. What Leggio called the longest three weeks of his life began Oct. 1, when the Winnipeg Jets organization released him from his short tryout, leaving him fretting about his uncertain future. When Leggio struggled badly in 2014-15 with the Bridgeport Sound Tigers, the New York Islanders’ AHL affiliate, he started worrying he would never receive a chance to play in the NHL. “That was tough to deal with, but I tried to block it out,” Leggio said. But that poor campaign hurt more than his NHL aspirations. Leggio was once perhaps the AHL’s best goalie, posting some gaudy numbers as the Rochester Americans’ workhorse starter in 2011-12 and 2012-13. “I was looking at everything,” he said. Leggio wrestled with taking a job in the ECHL, a league below the AHL he quickly outgrew after playing one season in 2008-09. Eventually, the opportunity in Germany materialized, and he a signed a contract Oct. 20 with a team sponsored by Red Bull. Leggio won a championship in 2009-10 in the Finnish SM-liiga, so he knew the European game well. That season caught the Buffalo Sabres’ attention, and he spent the next three seasons playing for their AHL affiliates. He performed so strongly in 118 appearances in Rochester he deserved a recall to the Sabres but never received one. Following another notable season with the Hershey Bears, Leggio posted awful numbers – 3.93 and .861 – in Bridgeport. After splitting time during the regular season in Munich, Leggio was awarded the starting job in the playoffs, and he responded with perhaps the best two-month stretch of his career. Leggio said he felt cold celebrating his championship in lederhosen featuring the Red Bull logo the team handed out to players. “That’s what they do in Bavaria, I guess,” he said. During another part of the celebration, a double-decker bus carrying the team was cut off by a Maserati and hit the car.